There are two items in my closet that I am constantly wearing, and can never have enough of. The first is the leather jacket (as recently blogged about here) and the second is the blazer. Along with leather jackets, blazers are items I believe every woman should have in their wardrobe, as they instantly add polish to an outfit. There is nothing I love more than wearing a distressed pair of jeans and a tee shirt, then throwing on a blazer. Whether the blazer is structured, boyfriend, bouclé, or silk, they add the perfect finishing touch to any outfit, and I was excited when I rediscovered this cropped, equestrian style blazer in my closet. Paired with my high rise jeans and a silk blouse, I thought made for a fun fall look. Because this blazer is couple of years old, I had trouble finding a similar style for all my readers (that wasn't over $1000), but after a lot of searching, I found a pretty good alternative from Boohoo for only $16 (linked below). 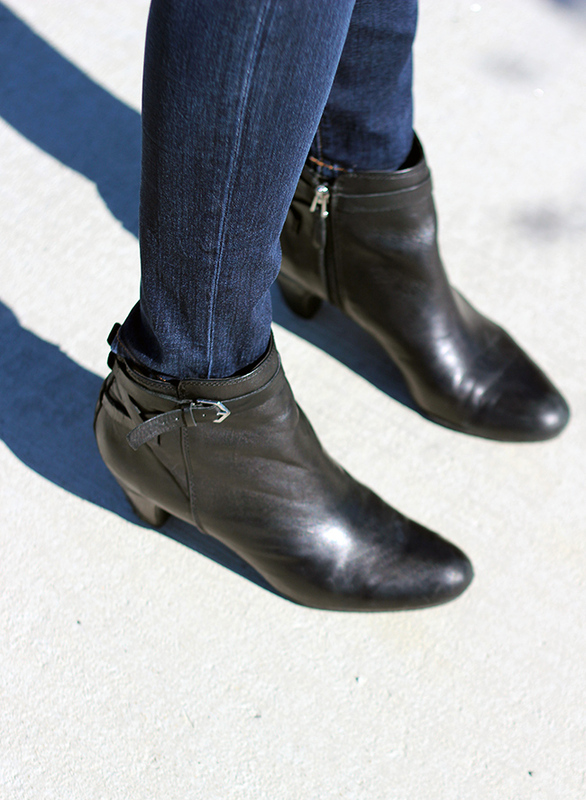 I've recently talked about how these J Brand Maria are my favorite high rise jeans (last worn here). They are the beyond comfortable and I love the rise on them, especially when tucking in blouses. However, after looking at these photos, it's time to admit that I need to buy a new pair. Knees should never be that baggy, even when you're going for the mom look! 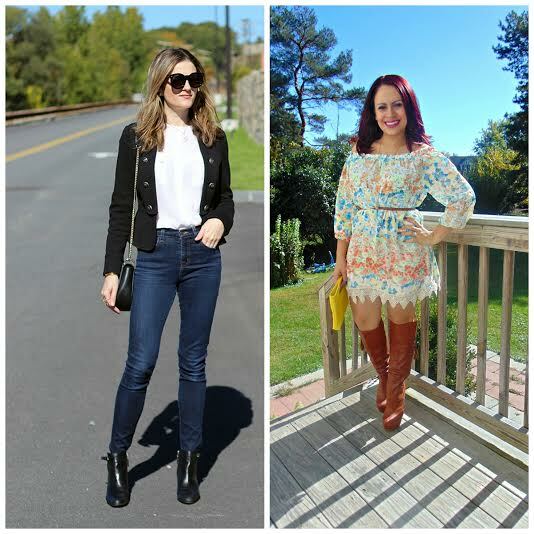 Time for the Weekend Wear Link Up! Thank you for reading and linking up! I wish everyone a great weekend. We are heading up to Vermont again for another fun fall weekend. Also, if you haven't entered to win a $500 Nordstrom or cash giveaway, you can do so here. Great look! Black and white is always so good! Beautiful classic look! Love that jacket! I love this blazer! I can't believe it isn't from this year. It looks like something that would be at the stores this year. I love it with this casual outfit. It really is a statement piece and makes the whole outfit instantly chic. You look fantastic. Have a great weekend! You look so pretty! I love the blazer and delicate necklace! I also like the style of this blouse. Have a wonderful weekend! You look great in these high waisted jeans! That blazer is also really cool. I love the button details! Such a fresh look, i love it ! I'm in love with this blazer. The button details are so chic. I would seriously wear it with everything if I owned it :) Hope you had a great weekend! I am all about my leather jacket too, I wear it all the time. I love your blazer! This military-like jacket is a great piece. You're so stunning.